This volume does a truly masterful job with a remarkable range of topics. It also widens the spectrum dialogue about these issues to permit the discussion of perspectives that are usually neglected or ignored in most books on public policy. In this era when many people seem to have almost given up on the possibility of achieving fundamental social, economic, and political change, I believe that this book will be greeted as an inspiring source of hope. The author is clearly worthy of praise for writing a book suggesting an alternative to the current corporate-based model of capitalism. 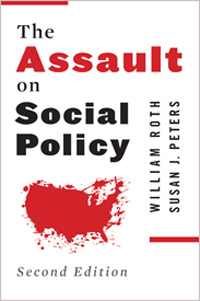 ... Any reader committed to the traditional liberal position and wanting to know more about social policies will learn a great deal about the philosophical foundation of social policy in the United States. Roth has written an impressive book that should be read by every member of Congress, by all students of social policy, and everyone else who is concerned about the future of this country and our basic institutions.